OM-PL Series Temperature and Temperature/Humidity Models are in the end of life cycle. As a possible substitute, please check out Newest Released Temperature and Humidity Portable Data Logger OM-HL-SH Series for more advanced features. The OM-PL Series data loggers are versatile devices that can be used for a wide range of logging applications. Each data logger is capable of sampling data as fast as once per second or as slow as once every 18 hours. The data logger can stop recording when memory becomes full, or rollover for continuous recording. The start of recording is software selectable to be immediate, delayed, or initiated when the datalogger door is closed. The data loggers can also be used to monitor high and low alarm events, that indicate if the recorded data passed above and/or below the user selected threshold. The alarm events are stored separately from the data samples and are not affected by data rollover. When the recorded data passes the high or the low alarm threshold, the data logger records the time of the alarm. When the recorded data returns to within the acceptable range, the data logger records the duration of the alarm. Up to 50 such alarm events can be recorded. The datalogger has a visual indication of an alarm condition without the need to connect to the computer. The data loggers have an internal real time clock/calendar. This real time clock is used to record the time stamps for data samples and alarm events. This real time clock is independent of your computer clock, and can be set separately, or set to match your computer clock. The data loggers provide a high level of data security. They have physical security, where the data access door is locked, and software security. It is virtually impossible to falsify the sample data or alarm information of the OM-PL Series dataloggers. The data loggers are extremely low power. Under normal operating conditions, a 9 volt alkaline battery will last from 18 months to 2 years. 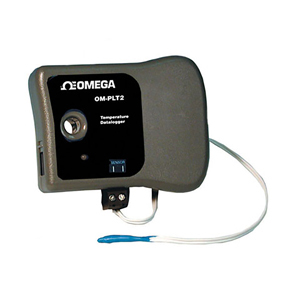 OM-PL Series data loggers have the capacity to store over 10,000 readings. Simply connect the datalogger to your PC’s serial port and use the available Windows software to set up the parameters for your recording session. Once the datalogger is set up you can disconnect it and put it in the field to record data. The data logger door can be locked on to prevent accidental or intentional disruptions of the recording session. When recording is completed, reconnect the data logger to your PC and download the recorded data using the Windows software. The Windows software allows you to view recorded data in text or graphical format. Models are available to record internal temperature and an external temperature channel (OM-PLT2), two external temperature channels (OM-PLTT), temperature, humidity and dew point (OM-PLTH), temperature and pressure (OM-PLPT), AC current and voltage (OM-PLCV), 4 to 20 mA (OM-PL420), and internal temperature and an external thermocouple input (OM-PLTC). Interface: COM (RS232) serial port. Software supports COM1 through COM8. Optional USB interface (model no. OM-PL-USBS). Alarm Memory: Up to 50 alarm events. Data Format: Custom format exportable to text or Excel spreadsheet. and used as a real time, multichannel sensor with logging capability. 注: OMEGACARESM extended warranty program is available. Ask your sales representative for full details when placing an order. OMEGACARE SM covers parts, labor and equivalent loaners. All dataloggers are supplied with complete operator’s manual. Model OM-PLT2 includes one external temperature sensor (4.6 m [15'] cable, epoxy coated tip). Model OM-PLTT includes two external temperature probes (1.8 m [6'] cable, 76 mm [3"] long stainless steel probe with penetration tip). Model OM-PLPT includes one external temperature sensor (4.6 m [15'] cable, epoxy coated tip) and one pressure transducer (1.8 m [6'] cable, stainless steel pressure transducer with 1 /2 "NPT male pressure port). Model OM-PLCV includes ac current clamp and set of voltage test leads. Model OM-PLTC includes (1 m [3'] long beaded wire type K thermocouple with subminiature male connector.